Summary: In the aftermath of a devastating loss, Cal and Jenny Horigan's marriage is unraveling. Both are plagued by guilt, unable to seek comfort from one another. Burdened by remorse, they begin to lose sight of the love that once anchored them-together with their sense of right and wrong. Given everything going on in my personal life right now, I'm not entirely sure why I decided to pick up SO NEAR by Liza Gyllenhaal. It's not that the description of this novel didn't appeal to me, but I'm not sure that now was the time for me to be reading a book about grief and loss. SO NEAR tells the story of a couple whose young daughter dies in a car accident. Of course, Cal and Jenny are both reeling with the pain of losing their daughter (which is difficult enough on a marriage), but they also secretly blame themselves for her death. They try a number of ways (many not-so-positive) to deal with their grief and they find that they are each shutting out their spouse and the marriage definitely suffers as a result. Not exactly a light, uplifting read. I found that I was immediately drawn into SO NEAR and I actually read the book in just two sittings. I don't know if I was so much "riveted" by the story, but I wasn't able to stop reading. In many ways, the characters' lives resembled as a train wreck for me. One because Cal and Jenny were both heading on a path to self-destruction; and two, because I couldn't turn away and not look! I could see where the story was heading and I'd probably go so far as to say that much of it was predictable, but none of that stopped me from needing to know what was going to happen. One thing I really liked about SO NEAR was how the author decided to tell Cal and Jenny's stories. The chapters alternated in each of their voices and I really felt as if I got to understand each of them because of this presentation style. I thought Ms. Gyllenhaal did a very good job of capturing their individual voices and making these characters into very complex and dynamic individuals. In addition, I found it interesting that she chose to write the last chapter of the book in third person and told both Cal and Jenny's story together. I liked this decision on her part and felt as if it symbolized the state of their relationship. Furthermore, I thought this novel did an excellent job of exploring the feelings of grief and guilt. I don't even want to think about how horrendous it would be to deal with the loss of a child, and if I felt I were to blame for the death, I don't know how I'd even begin to cope. And that's exactly the two huge issues that Cal and Jenny were dealing with. Both Cal and Jenny handled the loss of their daughter in very different ways, and their actions and feelings were probably pretty typical. However, they made the entire grieving process worse by not communicating with each other. At a time when they both needed to depend each other, they found themselves turning to others. One thing that kind of bothered me about SO NEAR was the character of Daniel. He was the man that both Cal and Jenny turned to with their secrets. Maybe it's because Daniel was just a despicable person, but I felt as if he wasn't as well developed as the other characters in the story. He was so awful and had absolutely no redeeming qualities (that I could see), and, as a result, I think he just appeared to be a stereotype of a "bad guy." I would have liked for him to have been more complex. He still could have been "bad" and served the same purpose in the story, but I would have appreciated his character more if he hadn't been so one-dimensional. 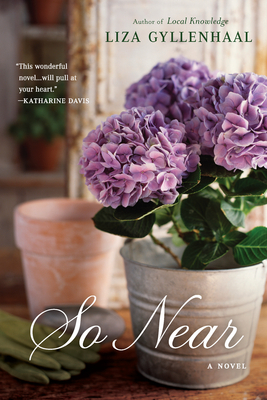 SO NEAR is an ideal pick for book clubs and there is even a discussion guide in the back of the novel (along with an interesting author interview.) I wasn't able to find a link to the guide on-line though. Some of the topics you might want to explore include grief, marriage, sibling rivalry, trust, deception, forgiveness, lies, secrets, adultery, and guilt. In addition, you can discuss how Jenny's garden serves as a metaphor for her life, and whether it worked for you... or not. I found almost every character in this novel to be very interesting, and I think most groups could talk about their actions and motivations for hours. While I found SO NEAR to be a difficult read at times, I still appreciated the book (enjoy might be too strong of a word here considering the subject matter!) I felt as if this novel did a good job of showing the various ways that grief can affect people; and I definitely recommend it to book clubs! This sounds like it would be a very intense read! This is one my to-be-read list, though I'm not ready to read about grief at the moment. This sounds emotionally powerful. I really enjoy books like this from time to time. It does sound intense (and something I would enjoy at the right time). isn't it striking how tragedy/loss often does tear families apart - misplaced guilt and blam.